Government on Friday hiked the import tariff value on gold and silver to $433 per 10 grams and $699 per kg, respectively, taking into account the volatility in the precious metals' global prices. Import tariff value is the base price at which customs duty is determined to prevent under-invoicing. The tariff value is revised on a fortnightly basis after analyzing the global price trend. Till Thursday, the import tariff value on gold was at $421/10 grams, while on silver it stood at $R663/kg. The notification in this regard has been issued by the Central Board of Excise and Customs (CBEC). In London, gold prices on Friday fell by 0.35 per cent to $1,327.20 an ounce and silver by 0.42 per cent to $21.17 an ounce. Domestic gold and silver prices remained down following weak global price trend. Gold is the second largest import item for India after petroleum. 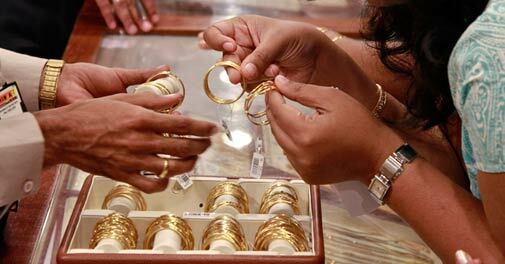 Government has taken several measures to curb gold shipments to address the high current account deficit. According to the jewelers body, total gold imports are expected to be not more than 550 tonnes this fiscal due to these restrictions, from 845 tonnes in the last fiscal.